What's worse than having someone walk off with an original factory sealed MTG starter box? Explaining to your insurance company why the case wasn't locked. Full-vision counters do double duty as checkout stands or high-security displays for hard to protect or high ticket items. There is a huge difference between admiring the insane detail of McFarlane or Kaiyodo action and toy figures, and dusting them. Showcase and protect collectible statues and sculptures with small, secure countertop cases! Remember when comics were the only thing for sale in comic stores? Neither do we. Clothes, toys, movie/TV/gaming tie-in merch, and kits all take up valuable space. 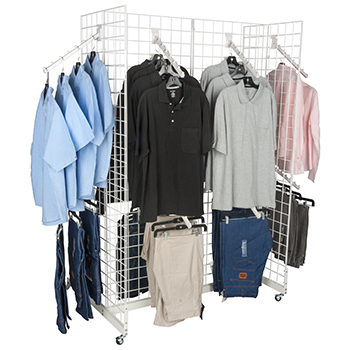 Easy to install gridwall displays and accessories can handle it all, from portable rolling t-shirt gondolas to wall-mounted panels for books and artwork! Does it feel like a new scale figure gets released every time Daryl Dixon changes his shirt? Finding a way to display hundreds of blister cardbacks can be tough. Wall-mount and freestanding slatwall fixtures are up to the challenge. Just like Daryl. Having trouble finding comic book store fixtures? It's not uncommon, sad to say. Remember the moment in the original Jurassic Park movie where Samuel L. Jackson's character describes the park as having "all the problems of a major theme park and a major zoo?" Comic store owners, managers, and employees can sympathize with the difficulty of a business that, by its nature, is many different things. Bookstore, game shop, clothing boutique, antique store, and toyshop all in one, with a dash of candystore and video outlet thrown in to mix it up. Finding affordable comic book store fixtures that don't break the bank, can handle the content, and can adjust to rapid changes in merchandise can be challenging at best and close to impossible at worst. Where can you find locking display cases, tens of different hanger styles, wall-mount and floor standing racks, all at discount prices? Here at StoreFixture.com, for one. Our high quality comic book store fixtures for retail outlets are designed to serve many purposes, and to meet any budget. Add to that low wholesale pricing on every piece, fast shipping, and lots of customization options, and it's pretty much a no-brainer. Is your common sense tingling yet? It should be! High ticket collectible figures need to be seen to attract customers. And seen fully, so that every detail, every tiny little molded nook, cranny, warp drive, or blaster belt holster can be appreciated without removing the merch from the store fixtures. And desired. And bought. However, they also need to be kept clean, undamaged, and safe. 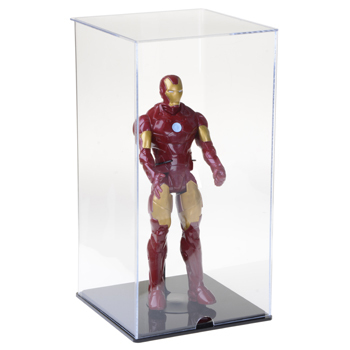 Smaller display cases hit that hat trick perfectly, and are available in sizes that can easily accommodate everything from single 18" statue to dioramas for full vinyl Pop!, 1/6, and 1/18" collections. 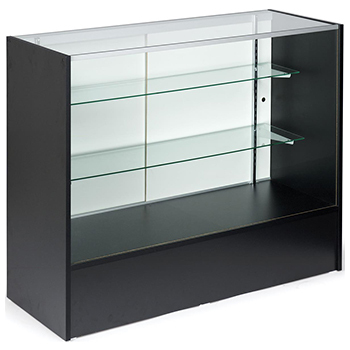 Lightweight acrylic boxes with lift-up tops, locking multi-tier glass spinner displays, and clear showcases with wood bases are only a few of the many styles and sizes available. Collectibles are the backbone of many comic stores. Wall books can be hung out of easy reach or slabbed for safety, but that's significantly harder to do where statues and sculptures, boxed trading card sets, and specialty rares or foils are involved. New and vintage items alike can need protection from dust, dirt, theft, or damage. The smallest collectibles, 1/18" scales figures, can easily disappear if the store fixtures don't lock. High security cases, or even rear-access glass counters, are ideal for allowing customers to look to their hearts' content without touching the merch. Sturdy tempered glass is safe for holding cash registers and other point of sale systems without blocking visibility. Books, graphic novels, t-shirts, dolls, TV or movie tie-in items, plastic and vinyl action figures, play sets... every comic shop has thousands of individual items spanning every possible size, shape, material, and price point. Items that sell better when displayed on store fixtures that allow customers free access. Our huge selection of gridwall (and slatwall) fixtures includes freestanding, wall, and counter displays as well as a full range of accessories designed to hold just about anything. Not every action or toy figure needs to be locked away and protected from human fingers (or robot arms, for that matter). A great deal of merch can — and even should be — left on shelves, racks, in bins, or on hangers for customers to see, touch, pick up, oooh-and-aaah over, and ultimately, buy. Unlike larger scale collectible statues and sculptures, many smaller action and toy figures come in blister packs with cardboard backers. Making sure that customers (especially those looking to do mods) can see exactly what models you carry is important. 10" slatwall hooks or 12" waterfall hangers are ideal for maximizing shelf space, and like the book spinners, clothes displays, and merch racks, come in a variety of sizes and finish colors. Slatwall fixtures and gridwall display racks are also perfect for soft goods like t-shirts, hats, gloves, scarves, socks, plushies, and Godzilla or Chewie hoodies. Not to mention the oodles of Sanrio stuff and current episode tie-ins. Slat and grid hangers, shelves and other accessories can be placed anywhere on the fixtures, which allows you to put the Millenium Falcons next to Han, the Tardis close to the Doctor, the fingerless gloves and hair ties close to Harley, and all of them near the paperback novelizations and graphic novels. Which will help keep even the pickiest customers happy while browsing, as well as hopefully increase sales. Your comic store has it all. Now where are you gonna put it? The thing about merch isn't so much storing it as making sure the customers can see all of it. On top of all the current titles and back issues, there's only so much space for wall books, magazines, novels, trading cards, clothing, toys, action figures and statues, games, and videos. Plus all the other stuff. Oh, and room for customers to move. 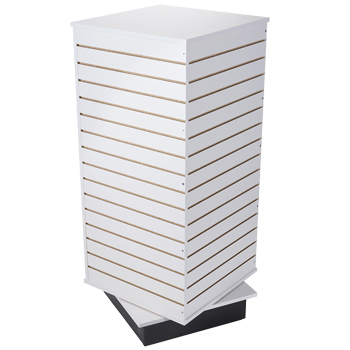 StoreFixture.com offers a huge variety of display cases, racks, stands, and hanger accessories in a wide variety of access styles. Locking styles for the collectibles, high visibility cases for the little things that are so tempting to shoplifters, easy-access racks for soft goods, and even bins for the plush toys are all easy to find here, easy to order, and will get to your shop faster than a speeding... okay, maybe not warp speed, but most items, including display cases, will ship the same day as ordered.